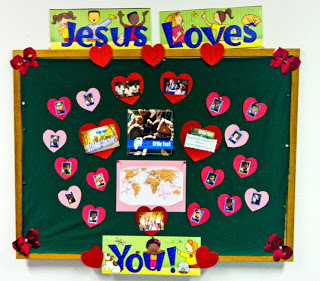 Day 111: Jesus Loves You! Bulletin Board – Auntie Jill and the children of Calvary Baptist Church in Stafford, KS made a beautiful bulletin board to welcome the choir. The board had a personal picture of each child, a group choir picture and even a map of the world highlighting Ethiopia and Honduras.